The final render of the latest Bifrost test. Really satisfied with how the water looks. The only thing botherhing me is that the tiny water drops on the edges of the box seem to be sliding like crazy. That can be solved in the emitter, by adjusting the Stickiness Strength. All in all a really good test to apply to the robot later. Render time: 36 hours and 9 minutes on a HP Z420 workstation. So i was wondering how the robot interacts with Bifrost… There is a scene in the movie where he climbs aboard a ship. The camera is really close by so in the final shot the camera will only see the hand. The most important thing about this shot is the water splash. I’m just testing out how it interacts with Bifrost. This is the latest playblast test just to see the animation. Some of the guys in the office said it was muddy, but I think the shader and caustics will change a lot. This render has a very low Voxel size to increase realism and a Resolution Factor of 2.5. The outcome is very satisfying and smooth, I’ve already put out an overnight render and it got 104 frames of 250 frames done. So the rendering is very heavy because of the huge mesh and caustics. I’ll let the computer render overnight again. I’m continueing the Bifrost test in Maya. I’ve got these blotches showing up and it’s annoying me. After some testing and playing around with the caustics settings I’ve found out the best way to get rid of the blotches are by increasing the photons shot at the scene… By a lot! I continued my progress with Bifrost and wanted to get more realism into the water. 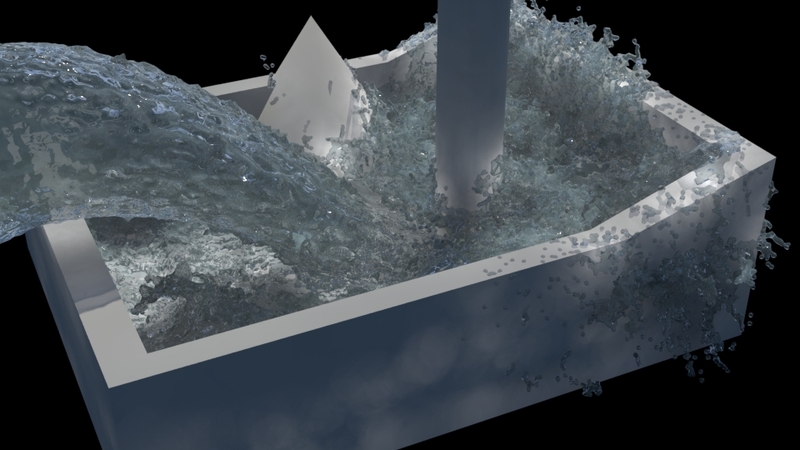 I created a scene where a lot of water is pouring into a cube. I also added some objects inside of the cube to get more water dynamics going. The way to go was to lower the voxel size inside the Bifrost sim. I tried .05 for this scene. Also the mesh has a high resolution factor to increase realism. 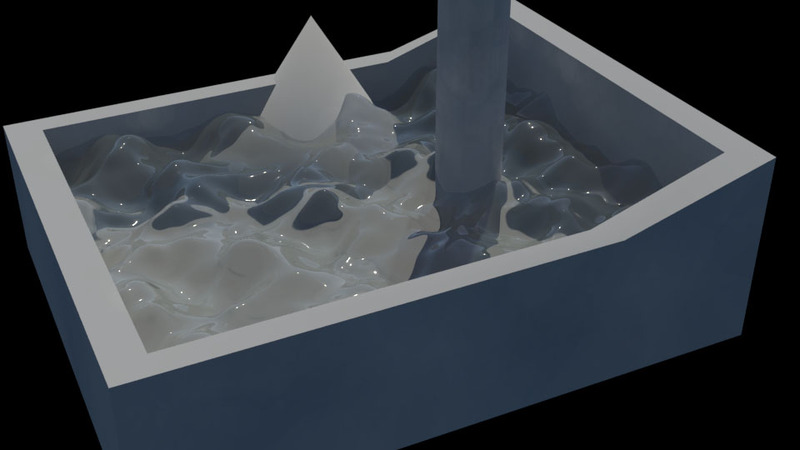 The first render was horrible, but it was just to test the mesh of the water. I had to run an alembic export over night and the 250 frames of water is a whopping 32 gigabyte file. Just to put it in perspective, in the 100th frame the mesh is over 10.000.000 polygons. The second and third image are tests for the water material. I’m using a mia_material_x and am using the water preset. Just like the last time i’ve been tweaking the numbers to get a nice water feeling. The problem here is that the render times are getting longer and longer because the mesh is so complicated. To reduce the render time i decided to use a cube with texture deformer to simulate a water effect. The render times went down from 7 minutes to around 13 seconds. This way i could be more effective and get that water look. After adjusting the settings i just put the material on my high poly mesh. Ok, I ran into a quite a silly problem in Maya. I wanted a bench to extrude along a perfect 180 degree curve as seen in the image below. From the surface menu I extruded along the edge and it came out the way i wanted visually. The problem was that I got 8 different polygon objects and merged them into one. But now as seen in the image below i didn’t have connecting vertexes. After first fixing face normals I tried to figure out how to fix the vertexes problem. Little did i know there is a sweet, sweet option to merge vertexes in proximity. After setting the correct threshold i got connecting vertexes! No more weird faces shifting along side of each other. Hooray for good topology! Faces, edges and vertexes now all joined! Even auto (double click) selecting edges works along the whole bench. I spent so many hours fiddling around with this problem it’s embarrassing, but I’m glad i got it done. The fill hole function also works like a charm! Back to working on the bench! Last week Friday i decided to work on my other PLP, i’m designing a house and implementing that into an environment. I kind of got sidetracked and got interested in Mayas Bifrost. I was following some tutorials and someone from the project told me that they still needed someone to help on the particles for the robot. So i’m going to help the guys on particles. That’s also why i got interested in Bifrost. For this scene i’m using mental ray physical sun and sky and image based lighting. The cube material is a mia_material_x with the MatteFinish preset. The water is derived from the mia_material_x Water preset and i tweaked the numbers from there to get the result that i want. There are a few things i want to change though, i think the water is still too blobby. I want to make it splash a little more and make the water less sticky. You can see when the water overflows on the edges it sticks too much to the surface. Also for the project, i want to do a Vray version of this to learn the software a bit so i can help the guys with the robot.